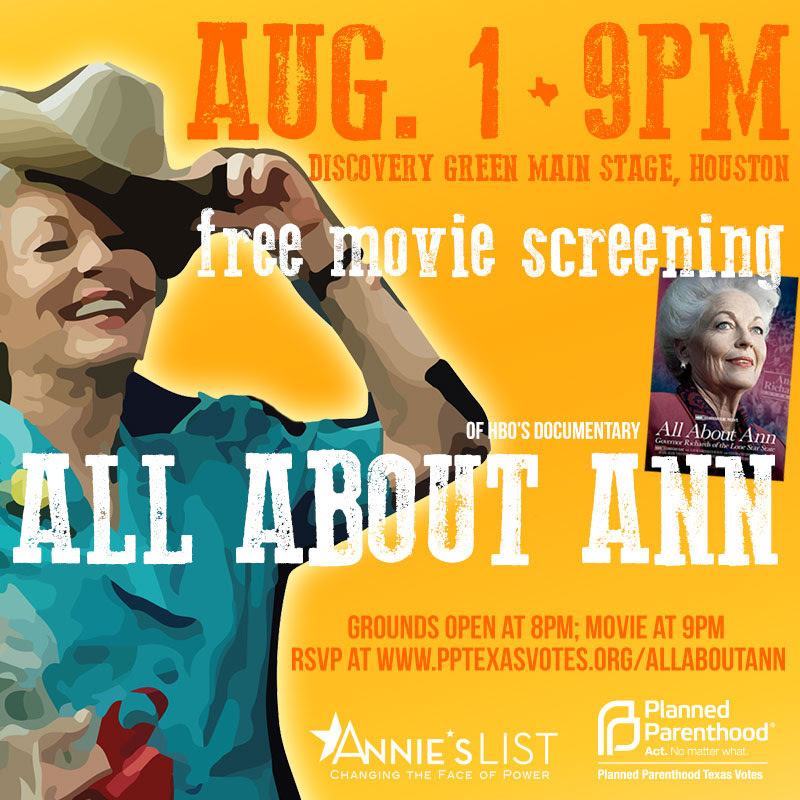 HOUSTON, TX – On Friday August 1, Annie’s List and Planned Parenthood Texas Votes, in partnership with a number of local elected officials and organizations, will bring “All About Ann”, HBO’s documentary about former Texas Governor Ann Richards, to Houston for FREE! Beginning at 8:00PM with live music, food and drinks, join us at Discovery Green’s Anheuser Busch Stage and enjoy this wonderful documentary about Texas’ only female Governor as we all work hard this fall to have Wendy Davis as the second woman in the Governor’s House! Drinks will be donated by 8th Wonder Brewery and Mayor Annise Parker will introduce the film. State Senators John Whitmire, Rodney Ellis and Sylvia Garcia, State Representatives Senfronia Thompson and Armando Walle, Mayor Annise Parker, Ambassador Arthur Schechter, Hon. Debra Danburg as well as Annie’s List Board Members Licia Green-Ellis, Eileen Olson, Kathy Overly and Amber Mostyn are just some of the proud hosts of this event. RSVP at www.pptexasvotes.org/AllAboutAnn. If you are interesting in joining the host committee to help cover costs of the event or are interested in a table at the event, please contact Shelby Hansen at Shelby@LillieSchechter.com or 281-224-4525. “All About Ann”: Fiesty, fiery, fearless, a force of nature . . . and funny as hell. These are just some of the words used to describe Ann Richards, one of the most charismatic American political figures of the last 30 years. This portrait chronicles the life of the liberal Richards who rose to power in a conservative state, effecting sweeping state reforms while becoming a beloved national icon. This entry was posted in Cultura, DC Promo, History, Las Mujeres and tagged all about ann houston, planned parenthood. Bookmark the permalink.